I’m not sure if I should question how Tarte Shape Tape Contour Concealer worked for me. Sometimes you don’t question miracles! Tarte Shape Tape Contour Concealer is a new concealer that launched for Summer/Fall 2016 which is now a permanent part of the Tarte Double Duty Beauty Collection that’s available exclusively at Ulta and tartecosmetics.com. So first off, I have no idea what the name means! Shape tape?! Shrug. I don’t get it but I won’t question it! But here’s the deets! Shape Tape Contour Concealer is a 2-in-1 full coverage concealer with a matte finish that’s available in six shade selections. Sure, it performs the regular concealer duties like covering up blemishes or dark circles. But you can use it as a highlighting, sculpting, and contouring tool by using one or more lighter and darker shades to contour with. If you’re embracing all the contouring and strobing trends that have been on the rise for the past few seasons this is a nifty little tool to contour with especially around the eye socket and upper cheek bone area as it produces a brightened, highlighted effect. Mine you, it doesn’t contain shimmer or sparkle! It relies upon a lighter, brighter formula to produce the strobing effect everyone is so mad about at the moment. I had my reservations about the formula though since it is a matte concealer. I have drier eyes, a matte finish concealer under my eyes isn’t one I’d seek out but as promised this formula does indeed have a creamy, hydrating consistency. I’d say the formula is most like the recently releases Aquacealer Concealer as both have the same super creamy, thick consistency however, Aquacealer sets a little slower has a bit more moisture. But there are a lot more differences in the formulas which I’ll explain below. Tarte packages this up in a barrel that holds 0.3381 oz of product. Shape Tape is a little cheaper at $24 than Aquacealer which is the same size at $26 if you were curious about the price and size differences. This has an attached giant sponge applicator much like Aquacealer! If you’ve used the MAC Wonder Woman Lipglasses and Hard Candy Glossaholic Lipgloss this is exactly the same applicator as that! Or heck, it might be bigger. This applicator is good for areas around your face but I thought it was slightly awakrd for use around my eyes! It seemed a little bigger than the one they include with Aquacealer! As I said above this is a thick, creamy concealer. If you have oily skin, it’s going to be your personal best friend as it dries and sets fast to a flawless, long wear. I know a lot of people that have oily lids and under eye areas which they have a hard time concealing since many formulas are very creamy and hydrating. This sets to a matte, seamless finish that wears very, very strongly. The formula is a little difficult to blend since it sets so quickly. You have to move fast to blend this under your eyes and I’ll admit some tugging was involved. I was most impressed with the fact that although matte it never creases, caked, or looked dry under my eyes in the least. It melds and conforms to a second-skin finish that looks incredibly flawless. The wear in warm, humid weather is incredible as I can get a solid 8 hours without it fading or creasing. It also has excellent pigmentation that will cover most any woes. Added plus, it doesn’t smell (Aquaconcealer smelled like a Sharpie Marker to me!). Tarte needs to make a foundation in this formula as I loved how it conformed and just melded with skin. It was like I wasn’t wearing anything at all! Dry skin might struggle with the blending process a little but Tarte Shape Tape Contour Concealer is pretty incredible coverage that’s worth the hassle. And oily skin? You won’t have a problem at all! This is seamless, beautiful coverage for all skin types! Tarte Shape Tape Contour Concealer is available now at tarte.com and exclusively at Ulta and Ulta.com. Hmmm I might have to pick up a tube of this when I place my 20% off Ulta order. I really haven’t even fallen in love with a concealer. I’ve tried Nars Radiant Creamy and was like “eh”, UD is alright, a little better than Nars. I’m currently using the Bare Minerals concealer and it gets the job done, but is by no means a HG. I wanted to try the Tarte Aquacealer but ended up passing on it because of what everyone said about the smell. How would you say it compares to the Bare Minerals BareSkin Complete Coverage Serum Concealer? I’ve been using that for dark undereye circles and it’s very good but not a HG for me. Thanks! They are different formulas completely. Bare Minerals isn’t a matte finish, it’s a hydrating one. This is thicker and creamier versus the gel-like creaminess of Bare Minerals. No real comparison between the two! hope this helps! Yes, thanks. Between this comment and others you made about it perhaps not being the best for drier undereyes, I think I’ll pass. No problem! It does wear surprisingly well under my drier eyes but it does require a bit of tugging during application and sets very quickly which allows for less room for play :-/ I don’t! Because they are always changing 🙂 anything in particularly you wanted to know about? I’m always looking for a better concealer. I’m Caucasian and have very dark brownish undereye circles and I’m in my 50s, so…. dry skin and crow’s feet. 🙁 I bought the Bare Minerals concealer based on your review and have mostly been very happy with it, but I always feel like there must be something even better out there, y’know? I know the feeling well Susan! I’m always looking for the next big concealer break through 🙂 I wouldn’t recommend it for someone in their 50s in all honesty, it might be a bit too difficult to blend if your eyes are quite finely lined. Have you tried Em the Great Cover Up? That’s lovely! Creamy, hydrating, good coverage! You should try the little amazing concealer by amazing cosmetics. Let it set complete before using and undereye setting powder. I like to buff out the concealer with the elf fluffy concealer brush, then use just a tiny bit of banana powder on the same type of brush but a different one (I put a little nail polish on the other one to keep them straight lol) and lightly pat it on. Hth! i THINK the name comes from a technique using tape to have a more perfected contour (i could be wrong though) and i’m pretty sure i’d be more likely to use this for a highlight and not strobing but i think i may need to pick this up. it seems bulletproof! Interesting! I’m def not up on contouring so, I was wondering what the “shape tape” referenced! It’s very long wearing! Not easy to blend under drier eyes but not too bad either! But very creamy and doesn’t crease! How does this compare to the Nars Creamy Concealer? I have dry skin (and drier undereyes) like you, and have been trying to find a great concealer. Unfortunately, I also have really dark circles and the Nars is just not enough coverage. However, I haven’t been able to find anything that works as well. I really liked the BareMinerals Bare Skin Concealer — the coverage was better and it was so hydrating! — but the formula creased on me within an hour. I know you love the Em Cover Up, but I’m hesitent to buy it without testing the colors. I have tan skin and so many companies lack sufficient color options. Since the Em isn’t available in stores, I have yet to try it. So, how does this compare? Generally, I’ve found Tarte products to be drying, but this looks promising. I was excited about the Aquaconcealer, but the strong scent you mentioned turned me off. I have the same issue with the It Cosmetics Bye Bye UnderEye Concealer (the strong is strong!). Hi H, This is a matte finish concealer with a thicker creamy consistency compared to the satiny finish and thinner, creamy texture of NARS. It’s also considerably more pigmented than the NARS formula. If you have drier eyes and you’re looking for something hydrating this is sadly, not it. It does provide full coverage and a quick to set formula that’s a little difficult to blend on drier eyes but does have good seamless coverage that’s second-skin like and long wearing without creasing. Hope this helps!? Thanks! That does help. Sadly, probably not right for me. Do you have any other concealers you would recommend? Other than your HG Em one, of course :-)? You mentioned my top three! Em, Bare Minerals Serum, and It Cosmetics! Those are basically the ones I use in rotation constantly. Have you ever tried Erase Paste by Benefit? It is a great color corrector and brighten and it is quite emollient. This is what I use to cover my discoloration and then use a separate concealer to do my highlighting. Erase Paste has been my HG for a long time. I will not be without it! interesting…wonder how this compares to the Clinique beyond perfecting 2 in 1 concealer and foundation…I just left my comments on that product at the corresponding post location. basically I love it! It is 1 million times better as the clinique 2 in one concealer and foundation is what i used to use! OoOh.That sounds perfect! Do you think it has as much coverage as the Urban Decay concealer? What’s the difference between the swatch images? They both say Shape a Tape light-med and med. The second image looks different, is that after its set for a few minutes? what would you say your best color match would be out of the 2, and how would this work on blemishes? I always look to see what you say about things because about 99% of the time I completely agree w you!! thanks muse!! Hi muse! Do you recommend aquacealer or this double duty beauty tape concealer? They both sound great, don’t really know which one to get. depends Tiffany! Both have excellent coverage but aquacealer is a better option for drier skin where as double duty beauty tape is best for oily skin or those who want to contour and conceal. Will check this out, but I’m an old broad, generally oily one, but massively circled genetically. 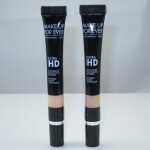 Usually use FAB triple duty, kind of a hybrid product and not really a concealer, with some cover fx concealer mixed in. Went out of town, outside today, and boy, did it look like the scourge of the evil makeup gods by 9 P. Bad. Virtually every straight concealer is way to yellow. (and I get the color wheel aspect of that.). Not too warm, too yellow. Kind of like the correctors better, IT corrector (but not the bye bye), Eve Pearl, and way in the past, benefit erase paste. Something peachy. Have you scoped the new Kvd ones? Like most folks, never really found an HG concealer. I haven’t yet the shade range descriptions are confusing to me so I’m waiting for them to launch in stores! I’m quite eager to try them! I’m curious as to what shades you typically are in concealers/foundations. The light-med shade looks quite darker than the light shade when looking into swatches. I also heard this concealer oxidizes quite a bit. I am around an NC30 and am hoping to go for light medium but am worried that it will be too dark once it dries! light to light medium is my typical concealer shade. Creamy beiges work best but nothing with too much yellow or to much peach. I didn’t feel it oxidized, I thought the shades actually ran a little lighter than what they said they were. For example Light/Medium, which is typically a good match for me, ran a little too light! May I know which shade will best match Nars Radiant Creamy Concealer in Custard? I am wondering how does this compare with It Cosmetics Bye Bye in terms of coverage? I’d say It Cosmetics has a LITTLE more coverage but this is no lightweight, it’s quite pigmented too! Hi, Muse! Formula-wise, do you think this concealer is more similar to the Aquacealer or the squeeze tube conealers Tarte comes out with? I fell in love with the idea of the Aquacealer when it came out but it was horrible on my skin–it clogged my pores badly and caused me to break out (which never happened with their Amazonian Clay in a tube or the Maracuja). Neither, the tube is very creamy/emollient and the Aquacealer is runnier yet creamy where as this is thicker, creamy, and matte. Hope this helps! Hey, I’m interested to know which has more coverage: shape tape or it comestics bye bye under eye? Bye Bye is a bit more pigmented! did you read the review? 🙂 I raved about it in this post. Korean makeup and skincare is some of the best out there in my opinion. Yay happy to hear your success story Pam 🙂 I have dry eyes and it works great for me too! M dry under my eyes (not on my lids), and getting more and more fine lines (34y). Ive been using Clarins concealer for a while, which I like because it is hydrationg but I feel that the more hydrating…the less long lasting and coverage. And I would want to try something new/more coverage. This is a bit more pigmented when compared to Naked Concealer but Naked might be bit more creamy and hydrating in texture. I have dry eyes and it works fine with me so long as I prep very, very well with a good hydrating eye cream! Hi there! I have very dry under eyes and have found a very comfortable concealer: it’s the becca Aqua Luminous Perfecting concealer. it is very comfortable to wear over my eye cream (Clinique all about eyes, regular formula I don’t like the Rich version). I just let my eye cream absorb, then use a thin layer of becca concealer. I live in the south where its very hot and humid so I have been setting it with tarte setting powder, but I’m sure once the winter gets started and the humidity gets lower, I can wear it on its own. highly recommend it. I did try the shape tape but couldn’t find a color match for me (I’m medium/tan) and I also felt like it oxidized on me. so if you can find your color match, it may work for u too! I think It is fabulous. It’s a favorite of mine but I think Shape Tape is a little easier to work with and easier to blend and a heck of a lot less emollient and much more creamier. However, Bye Bye is way more pigmented. Hope this helps! Hi there– If I am shade “15 Fair” in the Maybelline Fit me Concealer, what would you say is a good match to this shade? I don’t have 15 Fair in Maybelline Fit Me Concealer, so can’t compare. Sorry! Hi! I am usually nc20 in prolongwear concealer but idk which shade to get. I got light neutral but it oxidized on me. I’m thinking light medium? I currently use the Nars creamy radiant concealer in custard, not sure which shape tape concealer to get as in the UK, it’s stocked online. I’m not sure. I don’t have all the shades to compare!